This application will help you not to exceed your call sms and data limits. Understand your phone usage better, compare plans from different carriers much easier. 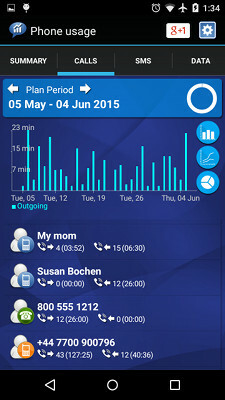 It accurately tracks your monthly, prepaid or postpaid plan, counts remaining free minutes. Warns about extra charged numbers. Traces apps that are transferring the most data. Compatible with most mobile plans. Saves money on your phone bill for free. Find applications transferring the most data. Avoid high per-minute or per-call charge. Keeps unlimited call history log. Support for almost all operators in the world. Do not waste your time and money for unwanted calls. 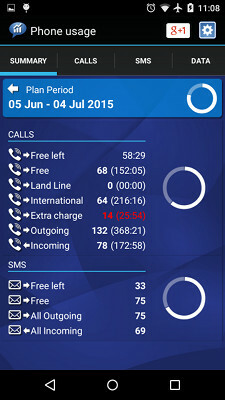 Detailed statistics of your calls, sms and data usage. Lookup callers in internet resources, detect spam and fraud. Counts remaining free minutes and sms messages according to your phone plan. 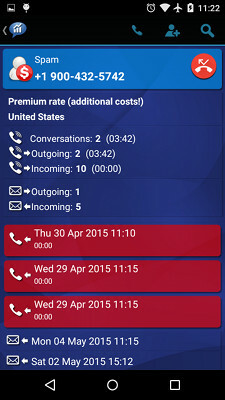 Separately counts international calls, mobile, land line, toll free and premium numbers. Recognizes voip, voice mail. 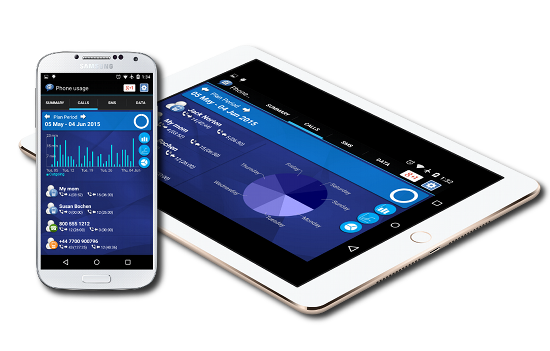 Shows graphs with detailed statistics of incoming and outgoing calls and sms messages. Shows cellular and wifi data consumption per application. Tracks down and reports which applications are using the most data. Not running in the background to save your battery and not to slow down your device! Supports plans of almost all operators in the world such as Vodafone, Airtel, Móvil, Telcel, Claro, Idea, Movistar, o2, Orange, T-Mobile, Verizon, AT&T, TIM, BSNL, Virgin, Aircel, SoftBank, US Cellular, Metro pcs plans. 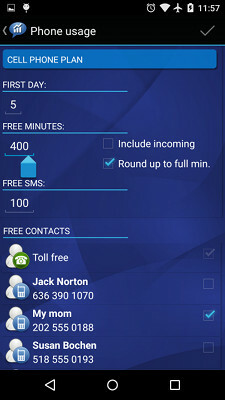 Lets you specify the first date of the monthly billing period, number of free minutes and sms included in your package. Customizable list of free numbers. 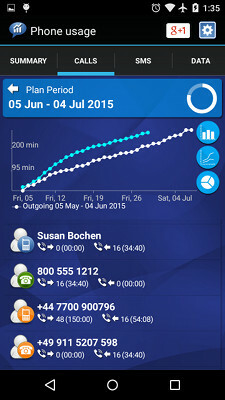 Support for plans with free calls time rounded up to full minutes. Option to include incoming calls time to your monthly allowance, specific for US cellular plans. Allows you to lookup unknown phone numbers in online databases and other resources. Detects extra charged phone calls, premium numbers, shared cost. It will help you to avoid high per-minute or per-call charge. Allows you to easily block / unblock unwanted calls. This app protects privacy, it does not sent anywhere any numbers from your contact book or other private information. This application is designed to save your battery and will not slow down your device. Other similar applications usually do data processing in the background, when you receive a call, transfer data package etc, as a result android phones start to work much slower over time.